Knowledge of them comes chiefly from that reconstruction, along with material evidence from archaeology and archaeogenetics. The Proto-Indo-Europeans likely lived during the late Neolithic, or roughly the 4th millennium BC. Mainstream scholarship places them in the Pontic–Caspian steppe zone in Eastern Europe (present day Ukraine and Russia). Some archaeologists would extend the time depth of PIE to the middle Neolithic (5500 to 4500 BC) or even the early Neolithic (7500 to 5500 BC), and suggest alternative location hypotheses. By the early second millennium BC, offshoots of the Proto-Indo-Europeans had reached far and wide across Eurasia, including Anatolia (Hittites), the Aegean (the ancestors of Mycenaean Greece), the north of Europe (Corded Ware culture), the edges of Central Asia (Yamnaya culture), and southern Siberia (Afanasievo culture). The Kurgan hypothesis, as of 2017[update] the most widely held theory, depends on linguistic and archaeological evidence, but is not universally accepted. It suggests PIE origin in the Pontic-Caspian steppe during the Chalcolithic. A minority of scholars prefer the Anatolian hypothesis, suggesting an origin in Anatolia during the Neolithic. Other theories (Armenian hypothesis, Out of India theory, Paleolithic Continuity Theory, Balkan hypothesis) have only marginal scholarly support. The Armenian hypothesis, based on the glottalic theory, suggests that the Proto-Indo-European language was spoken during the 4th millennium BC in the Armenian Highland. This Indo-Hittite model does not include the Anatolian languages in its scenario. The phonological peculiarities of PIE proposed in the glottalic theory would be best preserved in the Armenian language and the Germanic languages, the former assuming the role of the dialect which remained in situ, implied to be particularly archaic in spite of its late attestation. Proto-Greek would be practically equivalent to Mycenean Greek and would date to the 17th century BC, closely associating Greek migration to Greece with the Indo-Aryan migration to India at about the same time (viz., Indo-European expansion at the transition to the Late Bronze Age, including the possibility of Indo-European Kassites). The Armenian hypothesis argues for the latest possible date of Proto-Indo-European (sans Anatolian), a full millennium later than the mainstream Kurgan hypothesis. In this, it figures as an opposite to the Anatolian hypothesis, in spite of the geographical proximity of the respective Urheimaten suggested, diverging from the time-frame suggested there by a full three millennia. Bernard Sergent associates the Indo-European language family with certain archaeological cultures in Southern Russia, and he reconstructs an Indo-European religion (relying on the method of Georges Dumézil). He writes that the lithic assemblage of the first Kurgan culture in Ukraine (Sredni Stog II), originated from the Volga and South Urals, recalls that of the Mesolithic-Neolithic sites to the east of the Caspian sea, Dam Dam Chesme II and the cave of Djebel. Thus, he places the roots of the Gimbutas' Kurgan cradle of Indo-Europeans in a more southern cradle, and adds that the Djebel material is related to a Paleolithic material of Northwestern Iran, the Zarzian culture, dated 10,000-8,500 BC, and in the more ancient Kebarian of the Near East. He concludes that more than 10,000 years ago the Indo-Europeans were a small people grammatically, phonetically and lexically close to Semitic-Hamitic populations of the Near East. The Anatolian hypothesis proposes that the Indo-European languages spread peacefully into Europe from Asia Minor from around 7000 BC with the advance of farming (wave of advance). The leading propagator of the theory is Colin Renfrew. The culture of the Indo-Europeans as inferred by linguistic reconstruction raises difficulties for this theory, since early neolithic cultures had neither the horse, nor the wheel, nor metal, terms for all of which are securely reconstructed for Proto-Indo-European. Renfrew dismisses this argument, comparing such reconstructions to a theory that the presence of the word "café" in all modern Romance languages implies that the ancient Romans had cafés too. The linguistic counter-argument to this[original research?] might state that whereas there can be no clear Proto-Romance reconstruction of the word "café" according to historical linguistic methodology, words such as "wheel" in the Indo-European languages clearly point to an archaic form of the protolanguage. Another argument[who?] against Renfrew is the fact that ancient Anatolia is known to have been inhabited[when?] by non-Indo-European Caucasian-speaking peoples, namely the Hattians, the Chalybes, and the Hurrians. Spencer Wells suggests in a 2001 study that the origin, distribution and age of the R1a1 haplotype points to an ancient migration, possibly corresponding to the spread by the Kurgan people in their expansion across the Eurasian steppe around 3000 BC. ^ Watkins: "Yet, for the Indo-European-speaking society, we can reconstruct with certainty the word for “god,” *deiw-os, and the two-word name of the chief deity of the pantheon, *dyeu-pəter- (Latin Iūpiter, Greek Zeus patēr, Sanskrit Dyauṣ pitar, and Luvian Tatis Tiwaz)." ^ Anthony, David W.; Ringe, Don (1 January 2015). "The Indo-European Homeland from Linguistic and Archaeological Perspectives". Annual Review of Linguistics. 1 (1): 199–219. doi:10.1146/annurev-linguist-030514-124812. ISSN 2333-9683. ^ Mallory, J. P.; Adams, Douglas Q. (1997). Encyclopedia of Indo-European culture. Taylor & Francis. pp. 4 and 6 (Afanasevo), 13 and 16 (Anatolia), 243 (Greece), 127–128 (Corded Ware), and 653 (Yamna). ISBN 978-1-884964-98-5. Retrieved 24 March 2012. ^ a b c d e f g Watkins 2000. ^ Barfield, Owen (1967). "History in English Words". ISBN 9780940262119. ^ Underhill, Peter A.; et al. (2010). "Separating the post-Glacial coancestry of European and Asian Y chromosomes within haplogroup R1a". European Journal of Human Genetics. 18 (4): 479–84. doi:10.1038/ejhg.2009.194. PMC 2987245. PMID 19888303. ^ Sahoo, Sanghamitra; et al. (January 2006). "A prehistory of Indian Y chromosomes: Evaluating demic diffusion scenarios". Proceedings of the National Academy of Sciences of the United States of America. 103 (4): 843–48. Bibcode:2006PNAS..103..843S. doi:10.1073/pnas.0507714103. PMC 1347984. PMID 16415161. ^ Pereltsvaig, Asya; Lewis, Martin W. (2015). "1". The Indo-European Controversy: Facts and Fallacies in Historical Linguistics. Cambridge University Press. ^ Aikio, Ante (2012). "An essay on Saami ethnolinguistic prehistory" (PDF). Mémoires de la Société Finno-Ougrienne. Helsinki, Finland: Finno-Ugrian Society (266, A Linguistic Map of Prehistoric Northern Europe): 93f., 98. Retrieved 31 July 2017. ^ Mallory 1989, p. 185. ^ Strazny 2000, p. 163. ^ Haak, Wolfgang; Lazaridis, Iosif; Patterson, Nick; Rohland, Nadin; Mallick, Swapan; Llamas, Bastien; Brandt, Guido; Nordenfelt, Susanne; Harney, Eadaoin; Stewardson, Kristin; Fu, Qiaomei; Mittnik, Alissa; Bánffy, Eszter; Economou, Christos; Francken, Michael; Friederich, Susanne; Pena, Rafael Garrido; Hallgren, Fredrik; Khartanovich, Valery; Khokhlov, Aleksandr; Kunst, Michael; Kuznetsov, Pavel; Meller, Harald; Mochalov, Oleg; Moiseyev, Vayacheslav; Nicklisch, Nicole; Pichler, Sandra L.; Risch, Roberto; Rojo Guerra, Manuel A.; et al. (2015). 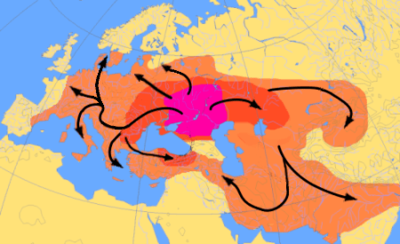 "Massive migration from the steppe is a source for Indo-European languages in Europe". arXiv:1502.02783. doi:10.1101/013433. ^ Allentoft, Morten E.; Sikora, Martin; Sjögren, Karl-Göran; Rasmussen, Simon; Rasmussen, Morten; Stenderup, Jesper; Damgaard, Peter B.; Schroeder, Hannes; Ahlström, Torbjörn; Vinner, Lasse; Malaspinas, Anna-Sapfo; Margaryan, Ashot; Higham, Tom; Chivall, David; Lynnerup, Niels; Harvig, Lise; Baron, Justyna; Casa, Philippe Della; Dąbrowski, Paweł; Duffy, Paul R.; Ebel, Alexander V.; Epimakhov, Andrey; Frei, Karin; Furmanek, Mirosław; Gralak, Tomasz; Gromov, Andrey; Gronkiewicz, Stanisław; Grupe, Gisela; Hajdu, Tamás; et al. (2015). "Population genomics of Bronze Age Eurasia". Nature. 522 (7555): 167–172. doi:10.1038/nature14507. PMID 26062507. ^ Mathieson, Iain; Lazaridis, Iosif; Rohland, Nadin; Mallick, Swapan; Patterson, Nick; Alpaslan Roodenberg, Songul; Harney, Eadaoin; Stewardson, Kristin; Fernandes, Daniel; Novak, Mario; Sirak, Kendra; Gamba, Cristina; Jones, Eppie R.; Llamas, Bastien; Dryomov, Stanislav; Pickrell, Joseph; Arsuaga, Juan Luis; De Castro, Jose Maria Bermudez; Carbonell, Eudald; Gerritsen, Fokke; Khokhlov, Aleksandr; Kuznetsov, Pavel; Lozano, Marina; Meller, Harald; Mochalov, Oleg; Moiseyev, Vayacheslav; Rojo Guerra, Manuel A.; Roodenberg, Jacob; Verges, Josep Maria; et al. (14 March 2015). "Eight thousand years of natural selection in Europe". doi:10.1101/016477. ^ Lara M. Cassidy; et al. (2016). "Neolithic and Bronze Age migration to Ireland and establishment of the insular Atlantic genome" (PDF). PNAS. 113 (2): 368–373. Bibcode:2016PNAS..113..368C. doi:10.1073/pnas.1518445113. PMC 4720318. PMID 26712024. ^ Rui Martiniano; et al. (2017). "The population genomics of archaeological transition in west Iberia: Investigation of ancient substructure using imputation and haplotype-based methods". PLoS Genet. 13 (7): e1006852. doi:10.1371/journal.pgen.1006852. PMC 5531429. PMID 28749934. ^ a b Underhill, Peter A.; Poznik, G David; Rootsi, Siiri; Järve, Mari; Lin, Alice A.; Wang, Jianbin; Passarelli, Ben; Kanbar, Jad; Myres, Natalie M.; King, Roy J.; Di Cristofaro, Julie; Sahakyan, Hovhannes; Behar, Doron M.; Kushniarevich, Alena; Šarac, Jelena; Šaric, Tena; Rudan, Pavao; Pathak, Ajai Kumar; Chaubey, Gyaneshwer; Grugni, Viola; Semino, Ornella; Yepiskoposyan, Levon; Bahmanimehr, Ardeshir; Farjadian, Shirin; Balanovsky, Oleg; Khusnutdinova, Elza K.; Herrera, Rene J.; Chiaroni, Jacques; Bustamante, Carlos D.; et al. (2015). "The phylogenetic and geographic structure of Y-chromosome haplogroup R1a". European Journal of Human Genetics. 23 (1): 124–131. doi:10.1038/ejhg.2014.50. PMC 4266736. PMID 24667786. ^ Semino, O. (2000). "The Genetic Legacy of Paleolithic Homo sapiens sapiens in Extant Europeans: A Y Chromosome Perspective" (PDF). Science. 290 (5494): 1155–1159. doi:10.1126/science.290.5494.1155. Archived from the original (PDF) on 25 November 2003. Retrieved 25 November 2003. ^ a b Jones 2015. ^ a b Mathieson 2015. ^ Morten E. Allentoft; et al. (2015). "Population genomics of Bronze Age Eurasia". Nature. 522: 167–172. Bibcode:2015Natur.522..167A. doi:10.1038/nature14507. ^ a b c Lazaridis 2016, p. 8. ^ Haak, W.; Lazaridis, I.; Patterson, N.; Rohland, N.; Mallick, S.; Llamas, B.; Brandt, G.; Nordenfelt, S.; Harney, E.; Stewardson, K.; Fu, Q.; Mittnik, A.; Bánffy, E.; Economou, C.; Francken, M.; Friederich, S.; Pena, R. G.; Hallgren, F.; Khartanovich, V.; Khokhlov, A.; Kunst, M.; Kuznetsov, P.; Meller, H.; Mochalov, O.; Moiseyev, V.; Nicklisch, N.; Pichler, S. L.; Risch, R.; Rojo Guerra, M. A.; et al. (2015). "Massive migration from the steppe was a source for Indo-European languages in Europe" (PDF). Nature. 522: 207–211. arXiv:1502.02783. Bibcode:2015Natur.522..207H. doi:10.1038/nature14317. PMC 5048219. PMID 25731166. ^ Allentoft, Morten; Sikora, Martin (2015). "Population genomics of Bronze Age Eurasia". Nature. 522 (7555): 167–172. Bibcode:2015Natur.522..167A. doi:10.1038/nature14507. PMID 26062507. ^ Wilde, Sandra; Timpson, Adrian; Kirsanow, Karola; Kaiser, Elke; Kayser, Manfred; Unterländer, Martina; Hollfelder, Nina; Potekhina, Inna D.; Schier, Wolfram (1 April 2014). "Direct evidence for positive selection of skin, hair, and eye pigmentation in Europeans during the last 5,000 y". Proceedings of the National Academy of Sciences of the United States of America. 111 (13): 4832–4837. doi:10.1073/pnas.1316513111. ISSN 0027-8424. PMC 3977302. PMID 24616518. ^ Reich, David (2018). Who We Are and How We Got Here: Ancient DNA and the New Science of the Human Past. Knopf Doubleday Publishing Group. p. 120. Jones, Eppie R. (2015). "Upper Palaeolithic genomes reveal deep roots of modern Eurasians". Nature Communications. 6: 8912. Bibcode:2015NatCo...6E8912J. doi:10.1038/ncomms9912. PMC 4660371. PMID 26567969. Lazaridis, Iosif (2014). "Ancient human genomes suggest three ancestral populations for present-day Europeans". Nature. 513: 409–413. arXiv:1312.6639. Bibcode:2014Natur.513..409L. doi:10.1038/nature13673. PMC 4170574. PMID 25230663. Cavalli-Sforza, Luigi; Seielstad, Mark (2000). Genes, Peoples, and Languages. Harmondsworth: Penguin Books. ISBN 9780140296020. PMC 33682. .
Piazza, Alberto; Cavalli-Sforza, Luigi (15 April 2006). "Diffusion of Genes and Languages in Human Evolution". In Cangelosi, Angelo; Smith, Andrew D M; Smith, Kenny (eds.). The Evolution of Language: Proceedings of the 6th International Conference on the Evolution of Language (EVOLANG6). Rome: World Scientific. pp. 255–266. Archived from the original on 10 September 2007. Retrieved 8 August 2007. .
"The Actual Achievements of Early Indo-Europeans, in Accurate Historical Context (2013)". Beckwith, Christopher I. University of California.